At a moment when the issue of safety and death in the skies in paramount in the public mind, a lethal mid-air disaster aboard a commercial twinjet airliner bound from Hong Kong to Denver triggers a pressured and frantic investigation. ©1996 by Michael Crichton (P)1996 by Random House, Inc. This book is worth listening to even if you didn't like the author's earlier books. If you are like me, and you're interested in believable behind the scenes analysis of an airline crash, this is definitely worth your time. There is a significant subplot regarding TV news magazines like 60 Minutes which adds to the enjoyment of this book. I listened to this book right after listening to Timeline. At first I thought that the pace of this book might be a disappointment, but as the characters developed I became more involved and eventually found myself really wanting to know what was going to happen next. The story is very believable with lots of relevant historical references to air transportation events. The protagonist, a women, faces not only the challenges of finding the cause of a mysterious air disaster, dealing with an unrelenting press, and avoiding being set up as a fall guy, but also the stigma of being a women in a male dominated engineering environment. The ending is clever and will catch you by surprise if you do not listen carefully. There are lots of insights into air travel safety. If you like your pace more like that of a mystery novel, with lots of technical background, you will like this book. This book is fantastic, Crichton at his best! I was hooked from the start, the intricate plot is just full of fine details that makes it very believable. The story twists and turns and is thrilling from start to finish, a great listen! If you like aircraft and drama, then you'll like this book. It combines technical information along with a well laid out plot of "Why?" which drives the investigation. Michael Crichton does it again in this "page turner" (if there were pages!). Enjoy! I really enjoyed the book. I couldn't quite understand the reasoning behind some of the physical threats to the main character. I don't think this added anything to the story. However, the corporate intrigue with its international implications really is a nice setting for the action. The way Crichton uses the media has a very satisfying feel about it. I thought the book started a bit slow but finished up very nicely. I enjoyed this, and learned a great deal about the airplane industry, too. The characters were great. I was a little disappointed in the anticlimatic ending; however I guess this was based on a true story, so that's life! I confess to being a Micahel Crichton fan so I was pre-disposed to liking this, and it definitely lives up to expectations. I like the female reader, Frances Cassidy, - her voice could have been made for the lead character. 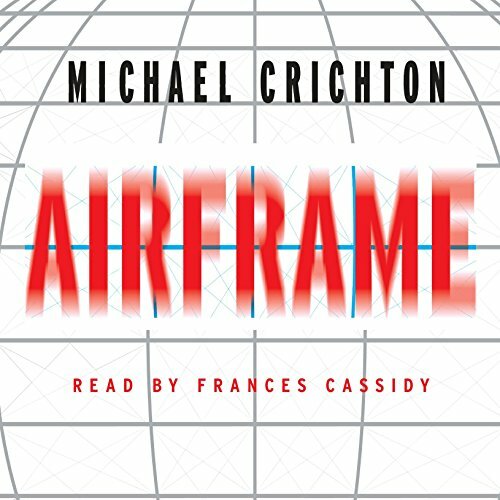 I enjoyed Crichton's portrayal of television news media and their need to sensationalize and, as ever, Crichton is able to wrap up a good deal of technical detail in a compelling, can't stop listening plot. This book was much different than Timeline, more along the lines of Disclosure. The book centers on one character who I found very engaging. I was rooting for her to overcome the conspiracy against her and solve the problem facing her! Crichton again includes lots of background info--scientific in nature--and he explains it in terms I was able to understand. For Crichton fans this is a must-read! Thought I'd submitted one already. The author makes very technical things understandable. I'll be looking for other Michael Crichton books I've missed after this one. Apparently the only reason this one isn't a movie is that it would be too expensive. You'll never see a plane the same way again. Meh, a bit technical but at least its not preachy. I got to the the end of the story, so it wasn't too bad, but definitely not one of Crichton's best stories. But it's also not his worst. Somewhere in the middle, below Timeline, above State of Fear, probably around Prey.The narrator was a bit monotone and it just sort of petered out at the end. Probably not worth a credit. Ein englisches Hörbuch für einen Deutschen mit Schulenglisch? Ich war mir nicht sicher, ob ich mir nicht zuviel zumutete. Aber der Roman ist auf deutsch nicht verfügbar und der Begleittext klingt so verlockend....Ich habe es nicht bereut. Als typischer Chrichton vermischt der Roman eine spannende Handlung mit gut recherchierten Hintergrundinformationen zu wirtschaftlichen und gesellschaflichen Themen. Dabei auch für einen Nichtamerikaner sehr gut verständlich. Airframe baut aus einer Notlandung nach heftigsten Turbulenzen, der Suche nach den Ursachen, den Wirtschafts- und Lobbyinteressen und der Sensationsgier der Medien ein sehr spannendes, dichtes Gewebe auf, welches mich sehr gefesselt hat. Airframe ist viel mehr als leichte, gute Unterhaltung. Deswegen von mir volle Punktzahl. In typical chrichton manner the writer opens doors,which normally remain shut to regular people.The line between fiction and reality disappears,when chrichton with breathtaking pace grants insight into the struggle a huge aircraft-builder has to face after a midair incident with several killed,against the media and even against dark forces inside the company.Was it pilot error or technical defect?after consuming this audiobook,traveling by plane will never be the way it was before.